The leaves, flowers, and berries of hawthorn contain a variety of bioflavonoids. Flavonoids found in hawthorn include oligomeric procyanidins (OPCs), vitexin, vitexin 4’-O-rhamnoside, quercetin, and hyperoside. Hawthorn Berry - capsule: Vegetable hypromellose (HPMC). Take one capsule twice a day swallowed with water. People taking prescription cardiac medications should consult with their doctor before using hawthorn-containing products. Below are reviews of Hawthorn Berry - 60 x 450mg Vegicaps by bodykind customers. If you have tried this product we'd love to hear what you think so please leave a review. Bought for first time from bodykind all arrived in good time, Bio Health is a good quality product, price very good as well, recommended by my GP have been using them for years for heart palpitations. 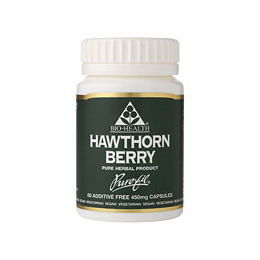 This product Hawthorn Berry by Bio Health is top quality, very effective and has the same benefit as taking a medicinal liquid supplement to me. I take it along with Lamberts Gingko Biloba to keep my Angina Symptoms at bay. Highly recommended. I have been taking Hawthorne Berry for my heart for 4 years - it appears to be doing what it's supposed to do without any side effects - ever!! The leaves, flowers, and berries of hawthorn contain a variety of bioflavonoids. Flavonoids found in hawthorn include oligomeric procyanidins, vitexin, vitexin 4-O-rhamnoside, quercetin, and hyperoside.